I'v long been a fan of cooper tires, and have recommended them to friends and family many times. My dad's Jaguar xj8, sister's Nissan Pathfinder, partner's Honda Element, and my 68 Plymouth Fury, all wear a set of coopers. They seemed like the obvious choice for my 2013 VW GTI, and the RS3-G1 sounded like the best thing on the market for the money. I put a lot of miles on my car, so a long-wearing, grippy all-season sounded ideal. After about 3,000 miles I'm considering just replacing them with something else even though they're virtually new. Inflated to the vehicle's specified 38psi, I've noticed a drop of about 2 mpg. Over a tank a fuel that translates to about 28 miles. I used to get just over 400 miles on a tank and now the refuel light comes on around 380. I commute 50 miles a day, mostly highway, with cruise control set at a constant. If I were carving canyons more regularly I might justify the cost for the added grip, which there is a lot of, but as a commuter these tires will cost me hundreds in additional gas money over their lifetime. On top of that, they're not as quiet as I had expected. On anything but fresh pavement they transfer just as much (if not more) road noise as the set of cheap-o tires that came with my car. I've been hoping that maybe they just need to "wear in" or something like a pair of shoes, and they'll get more comfortable with time, but that definitely isn't happening. When something seems too good to be true, it probably is. These tires performed good in dry condition....not in wet conditions tho.....but the reason i gave them 2 stars is that they are very noisy.......if you can put up with the humm and road noises then these would be considered a summer tire IMHO. 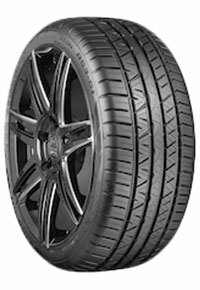 45K good miles on the Eagle GT, but because of rebate offer, purchased the Zeon R3-G1 as replacement, wanted an all season tire that was hopefully quieter than the Eagle GT. No question, much quieter ride at highway speeds on my Lincoln LS which is most comfortable at 80mph. Replaced my OEM tires with these, couldn't be happier. Better traction, control, looks and feel of the road. Rides smooth and are quiet. Very happy with these, I always bought the RS3-A, but I wanted to try these out and am very happy with my choice. Not expected it to be so good! I originally went in to my tire place to buy Pilot Super Sports, but was told to get these by the owner of the business. I was skeptical at first, but decided to pull the trigger on these after about 10 minutes of contemplating. My car has around 250 whp, and 330 ft. lb. of torque, so it's hard to keep traction on regular tires. I used to spin in third gear on my last set. I did my first pull, and immediately fell in love. These tires handle extremely well in all conditions. I would definitely recommend these for every performance based car! Wow! Quiet, Smooth Ride and Great Traction !!! I have struggled finding a tire for my 08 Passat 2.0T (235/45/17) that will give a smooth ride, run quiet and handle the power of my APR Stage 1+ Tune, Cat Back exhaust and Intake that my car has been modified with. 1st impression was how quiet the ride is, I don't hear any noise generated by the tires while cruising at 75 on the Interstate 2nd, these tires do a really nice job absorbing the imperfections in the road, I live in western NY and our roads are not great but these tires are the smoothest I have ever had on this car. 3rd, very little tire slip from a standing start. I am over 260hp now and could never use full power without tire slip until having these RS3-G1 on the car. 4th, straight line drivability is excellent, when you change lanes and cross the expansion crack between the lanes there is no wandering at all! Holding corners with no tire roll is great, I have upgraded suspension also and these tires stick with the road as hard as I have pushed them with no indication of loss of traction (G1 is within their limits). I don't expect these tires to last 50K but considering how they have transformed my Passat I will be happy buying another set when they do wear out. I have a few silver hairs, and bought my first Camaro convertible 3 years ago. Came with OEM BF Goodrich TA All Season tires. I drive my car all year long near Chicago. I am not interested in having performance tires for the warm weather and winter tires for the cold. So I opt for the All Season tires. The ride with he BFG's was hard and noisy, but thought it was inherent in a performance car. I use the word 'performance' loosely as I have a V-6. When the noise of the BFG's became intolerable (55K - with ample tread remaining), I took a chance with the ZEON G1's because of everything I have read about them. My Cooper dealer assured me I would like them. Now I have the best of all worlds - superior performance handling with touring quietness and a comfortable ride. The car is better now than when it was new. I am writing this simply because I am very impressed. I consider myself a very experienced tire man. I have worked for Goodyear and Bridgestone/Firestone. More than twenty years on the job. This tire is excellent in both wet and dry conditions. Very quiet. More grip than I will ever ask of it. Absorbs bumps with out being hard, like dedicated sport tires. Just very impressed. i drive a 1996 Formula Firebird, a fun car in summer, but not great in winter. my last two sets of tires were Goodyear gt all season. they were nice tires, but not great in rain, and poor in little slow. i got these Cooper Zeon rs3 (245-50-16) because Goodyear no longer made my size and these tho new had good reviews. mounted and balanced cost $670. a bit steep, but much less than my last set of Goodyear. i have driven on these now for about seven weeks in Portland Or. (nice town, but lots of rain) these tires handle MUCH BETTER than my old tires in the rain. i have not driven in the snow yet, and i will still try to avoid snow with this cat. i do feel if i get stuck in a snow fall that they will get me home. time will tell on that one. a some people said they are expensive, but for what they do, and the rating, they are a great deal. i would strongly recommend these tires. they do handle great in heavy rain and wet roads. much better than my Goodyear tires when they were new. and again great in rain, not sure yet in snow it is a bit early to say what i think about winter traction, tread wear, or durability. but, so far so good. I drive a 2004 Subaru WRX STi, AWD, with suspension mods and 340ftlb torque to the wheels, 326 WHP. I have always run summer performance tires for best handling, but wear is always an issue usually getting 20,000 mi out of a set of tires. I was VERY reluctant to try these new All Season G1's, but I an very glad I did. Nice aggressive look to the tire. Excellent initial experience. Tires are very quiet, they track straight with no tram-lining. Very good dry handing, equivalent to a summer performance tire. Have not been in the rain yet. I don't plan to be in the snow at all, but if dry performance is good at low temps, and wet is as good as expected, these will be a winner. I saw the review complaining about high price. I shopped on-line, had them shipped to a local dealer. I paid $600 installed ($520 for the tires including free shipping, $80 for mounting/balancing). I believe that is an excellent value for 235/40R18's. Buy these tires, you will not be dissappointed!